The automobile manufacturer Franco – Romena Dacia has, for some years now, been producing a line of vehicles that is both simple, functional and competitively priced. The Dokker is Dacia's first commercial vehicle; sold both as a minivan and light commercial vehicle. 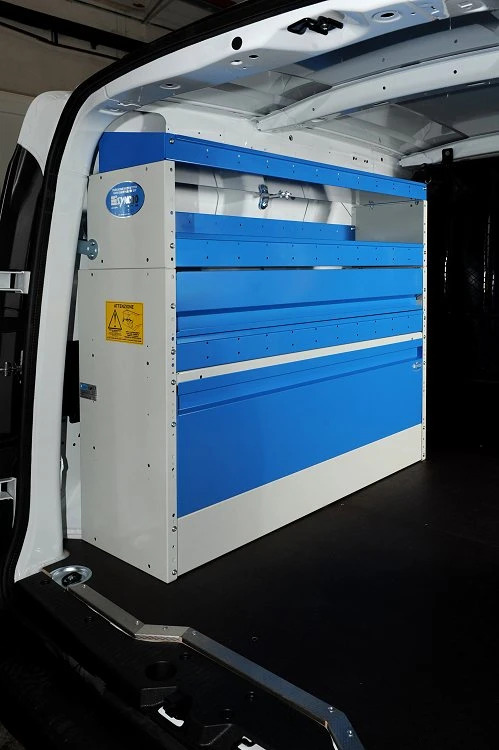 The commercial van version has cab space for driver and passenger, and the cargo space - in comparison with other vans of the same category - is spacious and well-adapted for both transporting materials and adding racking units, to transform it into a mobile workshop. 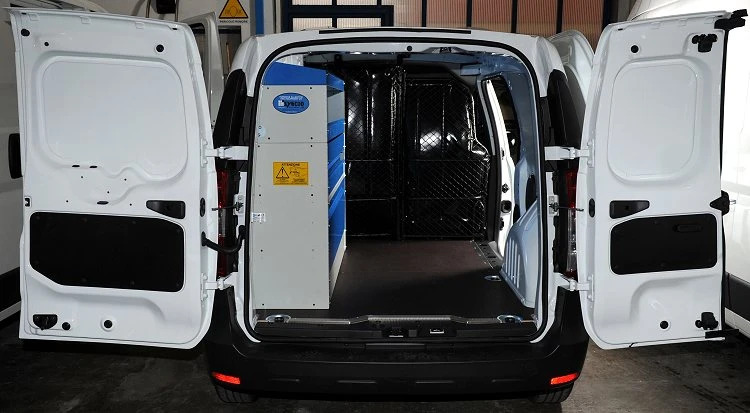 It has a very convenient large side door that makes it easy to load and unload cargo, as well as creating easy access to the interior upfit. 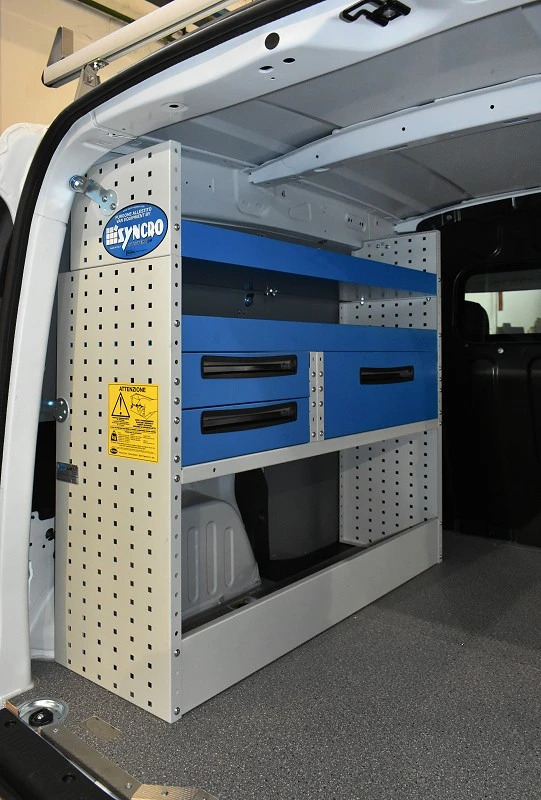 In the Syncro catalog, you will find the complete Syncro System interior protection line for your van's cargo area, like floor and wall paneling. You'll also find an enormous selection of shelving and drawer units, containers, ideas for organizing your workspace, and accessories. 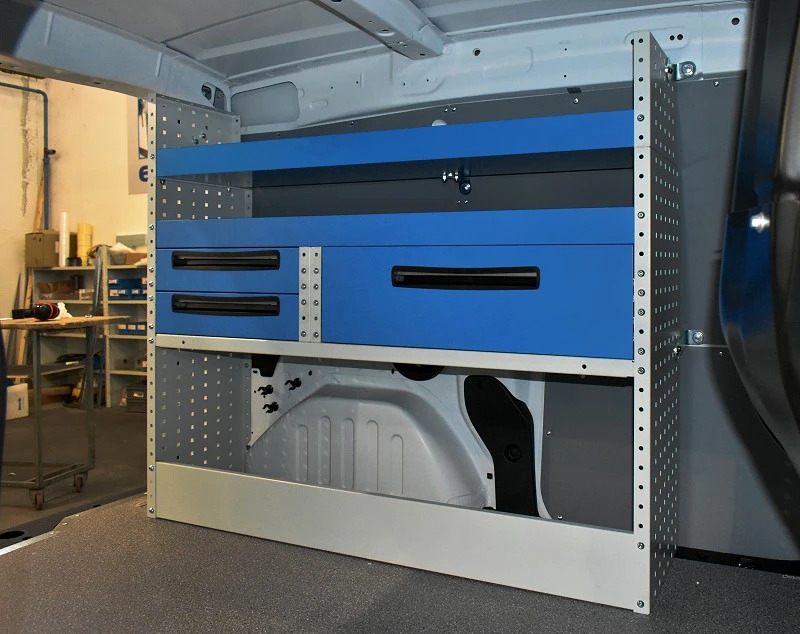 The installation of the the racking units can be done simply and quickly, thanks to the modularity of the Syncro components and thanks to the Dokker vehicle's straight lines. 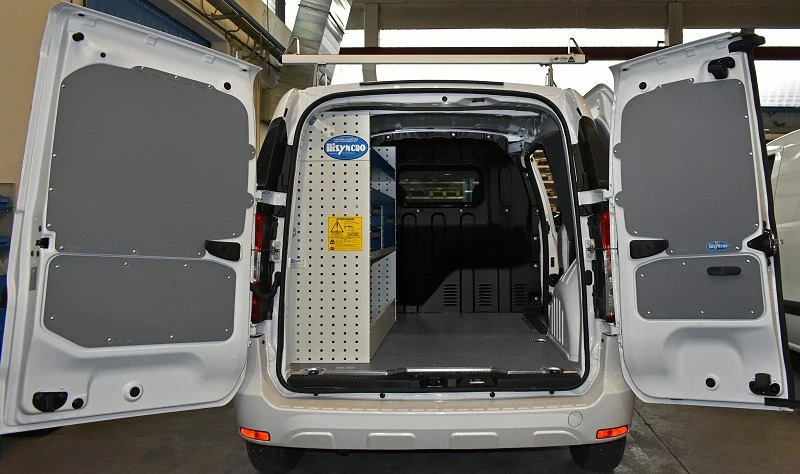 As you can see from the pictures on this page, the Syncro components are suited perfectly to the Dacia Dokker: the wall and floor panels protect the body from daily wear and tear and the racking units optimize the use of the cargo space, making work easier, faster and more productive. 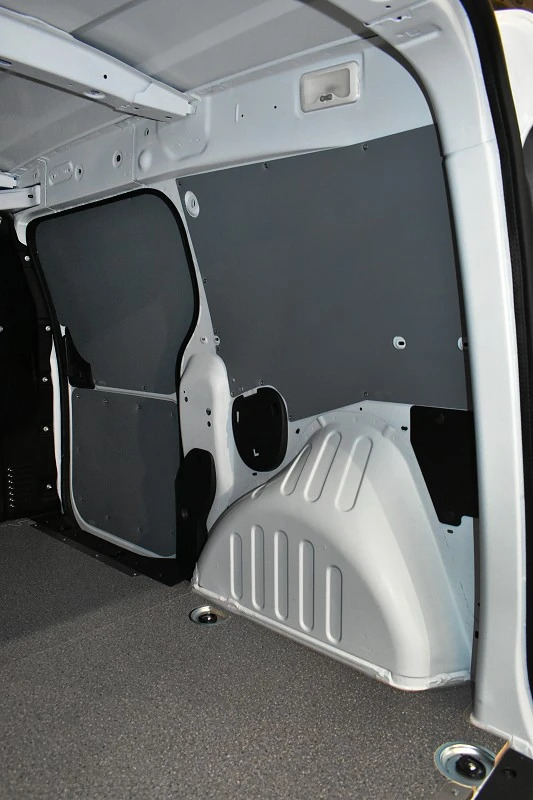 An example of a Dokker upfit with interior protective panels: the upfit on the left side of the cargo space consists of a wheel arch frame, metal and plastic drawers, and metal shelves with dividers. On the right side, we installed a drawer unit with clear plastic, forward-tilting drawers. We completed the upfit with a few useful accessories: paper towel roll holder, long tools and objects organizer, hanging cable holders for tubes, wire probes and extension cables. 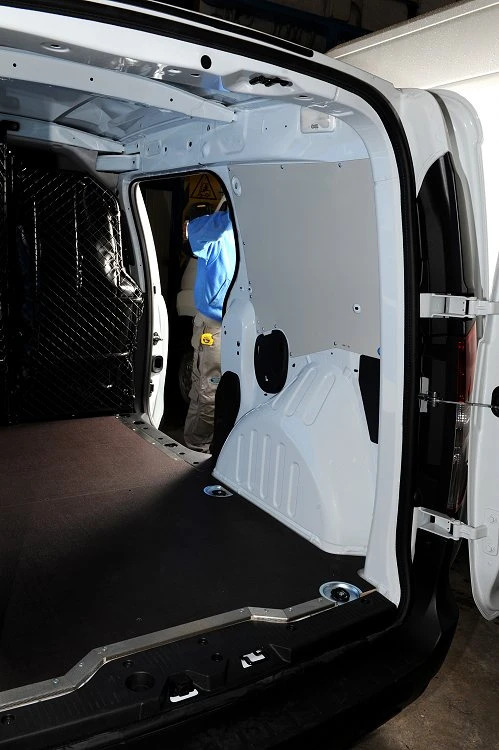 Another example of a Dokker upfit: after installing Syncro's special plywood floor panel to protect the van's original floor, we mounted coated galvanized steel paneling to the right wall of the cargo space for extra protection. On the left side, we put in an easy accessible shelving unit with a closed wheel arch frame with front door, a shelf (also closed) with front door panel, and two more shelves above that. Click here to see floor and wall paneling for the Dokker.